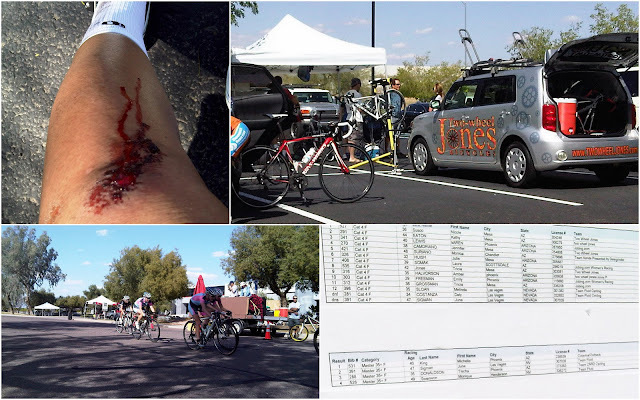 One of my worst fears associated with racing on a bicycle is crashing, especially in a criterium, or crit. Because this type of event involves turning corners rapidly and sharply yet safely with a large group on a short circuit (about 5 km) the chances of being involved in a crash increases. It requires requires good technical skills to stay competitive in the race and to sprint across the finish line often times in a pack. If you'd like to have a visual idea of crit racing, I've uploaded two videos: the first is of the Men Cat 4 finish and the second is of the Men Pro 1 race at Tour de Murrieta, CA. 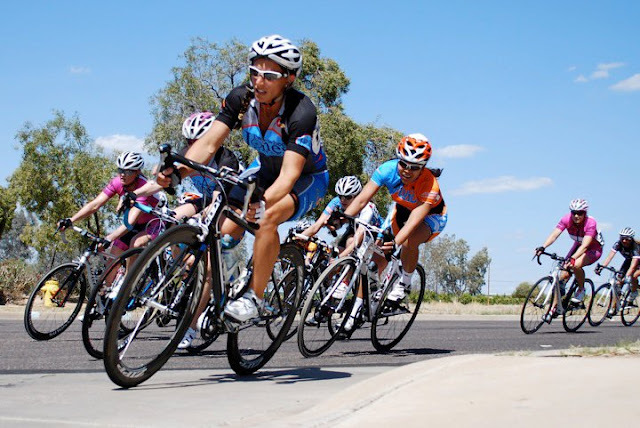 Since the San Tan Criterium was my second bike race and I have not trained on a regular basis, my only hope was to complete the race and stay upright. To my disappointment, neither would turn out the way I had planned. Saturday morning my teammates and I followed each other in two cars out of Las Vegas. Surprisingly our drive took less time than anticipated, about 5 hours with two stops before arriving in Mesa, AZ. The weather was gorgeous; sunny in the high 70s and hardly a breeze. We checked in at the registration desk before warming up on the bike trainers for a good hour. 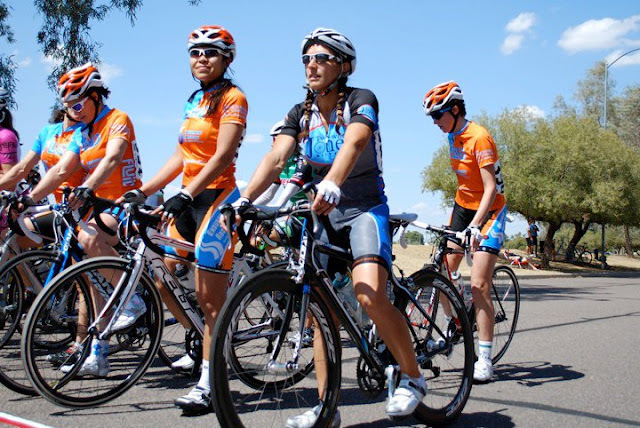 The combined field of Women Cat 4, 35+ (yrs. old), and Women 50+ had over twenty riders (much more than the five or so last year) who would race together. Finally it was time for us to line up at the start line. I thought, wow I am really here where many times I had seen others do exactly this but from the sidelines. I calmed my breath and the heart beating in my chest. The officials went over some rules of the race which was timed for forty minutes. They would not pull riders who get lapped by the field for falling behind and there is a free lap for mechanical issues down to the last five laps. And...GO! We were off. The race started off somewhat like popcorn coming out of a chute but after the first few laps we settled into a pace. Once or twice I feared another rider taking a turn too tight and cutting me off on the inside but other than the race went better than I pictured in my mind. I was surprised by how easily I stayed near the front of the group because I somewhat expected to be dropped by the pack because my cardio conditioning is out of shape. The whole time I had managed to find someone to ride behind and shelter myself from the wind resistance. This tactic of pedaling closely behind someone's wheel (or a car) to break the wind I would otherwise have to push through is called drafting and doing so saves a lot of energy which I was conserving for the sprint across the finish line. Near the end of the 5th lap, I felt really good about my chances of not only finishing the race but perhaps winning one of the top five places in my category, the Women Cat 4. Then as I made a right turn on to E. Jasmine St. my front tire skidded coming out of the turn. I looked down and notice the tire slowly deflating as I voiced my thoughts, "Oh no...you gotta be kidding me! I think I have a flat." The rim of the wheel must have pinched the tube inside. Then we made a left turn on N. Rochester. One of the girls said I should go the wheel pit; race rules allow one free lap for technical mishaps to which I responded that I didn't have a spare wheel. She then told me to ask for Two Wheel Jones for an extra wheel. I nodded to acknowledge that I had heard and understood her replying, "Yeah...if I keep going like this I'm gonna crash." as we banked left turning on E. Julep St. I was on the inside of the corner (like the photos above) and in that moment, my tire which was completely deflated by then rolled under the pressure of the turn and weight of my body. In that moment I knew I was going down since I was already partway to the ground leaning in to the turn. Next thing I remember, my head and left shoulder hit the pavement and my cheek...these darn chipmunk cheeks slid across the asphalt to a stop. In my mind I winced knowing I would have road rash on my face. Luckily no one riding behind me struck me nor did I knock anyone else off their bike when my own went crashing down. I got up, quickly inspected my bike for bent wheels or a dropped chain (which would prevent me from rolling it), and seeing it was still operable I started walking towards the registration and wheel pit area. Even if I got a spare wheel I don't think I would have a free lap since I was within the last five laps. I'd have to ride really hard to catch the group which was still possible since there were four laps to go. My right brake and shifter levers was crooked and would not be stable/safe to continue racing with and so I decided then to cut my loss. I'd have to tell the officials that I was done. The realization that I was out of the race settled in. My chances of finishing with the group was gone--and now I wondered what else had I scraped up on my bike, kit, and body. More insult to the injury of not finishing at all let alone place in the top five. I was in such a good position within the group. I felt good, I rode well, and I still had a lot of energy left for the dramatic sprint across the finish line. Gone. Gone because I had a flat. Gone because I crashed. Besides the scrape on my left knee, shoulder, hip, and face (and the resulting bump from smacking the pavement with my cheek), my bike was fine except for the bent and cosmetic scrapes on the shifter/brake levers. My helmet has a dent and it was a good thing my kit didn't have holes ground into it so it is still wearable. 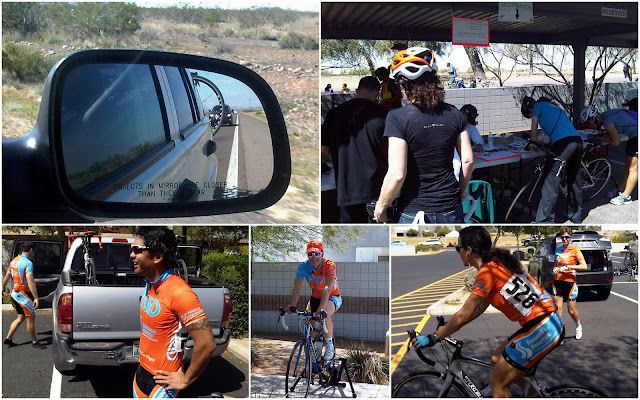 Many of the women I raced with who knew I had crashed expressed their concerns afterward and asked if I was okay. One rider who did not see me but heard me when my bike and I hit the ground said,"...(the sound) was spectacular!!". I gotta laugh at that; indeed the sound of a bike smashing the ground at 20 mph must have sounded grand. Next time you drive a car at this speed and take a turn, look down at the pavement and imagine jumping out of the car with only spandex on. Hopefully you never have to feel what it's like to hit and slide. Does this experience discourage me from racing again? Not at all. 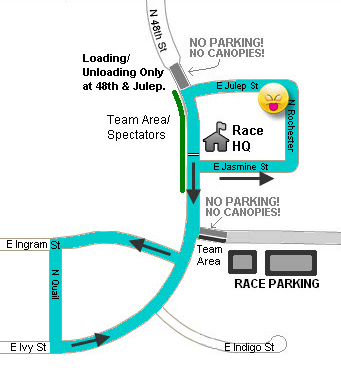 In fact I have another crit race today even though I am sore I will give it my best shot! Despite things not working out the way I had planned in yesterday's race, I took away from this a valuable lesson -- don't try to keep pedaling with a flat, more importantly avoid trying to take sharp turns (I've had flats before but never in a race and never tried turning). Slow down but continue straight forward and, if in a race or group, raise your hand and/or warn other riders that you have a flat so they'll go around you and stop as soon as you can do so safely. 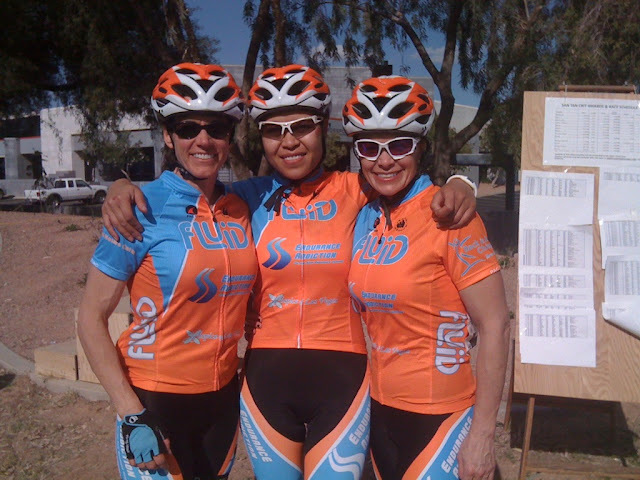 On the good news side our teammate June (pictured above to my left) placed 2nd in the Women 35+ category and 4th overall in the combined categories, Monique (pictured above to my right) placed 4th in the Women 35+, and our coach Melinda finished the Women Cat 4 placing 12. I am proud of my teammates; we rode a great race and I had a blast!! Nothing permanent - you tried, sounds like next time you'll do well. Thanks Joe. You are right, nothing permanent and I tried. :-) I wouldn't take the experience back for anything. Thank you Dolly and also for visiting. :-) Do you have any races planned for the near future? Sorry to hear about your crash . I wish I could of been there to take pictures of the race. I love watching the crits. Hope to see you at a race next time I am in town. You are the most amazing person. You have such a great attitude and never give up. On top of that you are a great rider. Keep it up! That is definitely one of my biggest fears too! Glad you are ok :) You guys did awesome!